This win comes at a time of transition for Sara--she has spent the last few years working to turn her jewelry-making hobby into a full-time career. In 2006, Sara started building her business, S.K. Rhoades Design, after being asked to sell her work at a local art gallery in New Harmony, Indiana. In the intervening years, she has become a new mother (her daughter Lyra, is almost three), earned a master's degree from the University of Southern Indiana, and taken on a new position as the senior gallery associate at the New Harmony Museum of Contemporary Art (where she sold her first pieces). Between juggling her many responsibilities, attending trade shows, and teaching jewelry classes and workshops, she has also found the time to become a prolific artist and grow S.K. Rhoades Design into a fledging business. "My goal is to be a self-sustained artist in three to five years," she says. 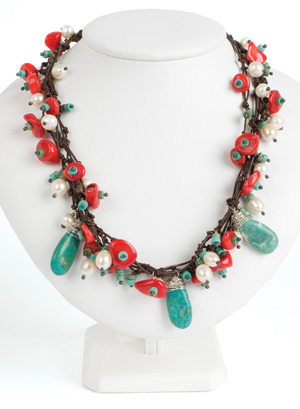 Despite the success that Sara has achieved in her bead business ventures, a note of disbelief is still evident in her voice when she describes her life as a jewelry artist. "I never thought that this is what I would end up doing!" she comments. She was introduced to lapidary jewelry by her husband's grandparents, who recognized in Sara her potential heir to their own passion for creating the lapidary arts. Since then, Sara's relationship with jewelry making has shifted from a newfound hobby to a lifestyle: "If I couldn't make jewelry, my whole world would stop--it's a compulsion." When asked if she has any advice for other beaders and artists, her reply is succinct: "Put your money back into what you love." By investing the money that she makes selling jewelry back into her work, Sara has avoided the need to take out a loan to support her company. Instead, she has built her business on a firm foundation of her own earnings. 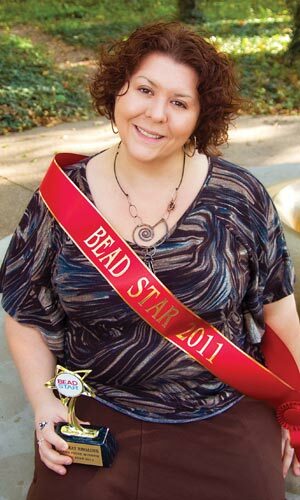 As the Bead Star Grand Prize Winner, Sara has won a $1,000 gift certificate from Fire Mountain Gems and Beads, as well as an all-expense-paid trip for two to Bead Fest Santa Fe, March 15-18, 2012. She already has a plan for how she will spend her winnings: she wants to buy her own kiln. Glass beadmaking has always intrigued the artist, but until now she didn’t have access to the necessary equipment to try it herself. She explains that she is a firm believer in the idea that "If you are doing something, you need to do it right." Now that she has the resources to buy her own kiln and materials, she is eager to start experimenting.